One of my goals for the year is to get myself a passport. Before 2014 ended, I was able to process it. I applied last December 19th and I got so busy that I finally had the time to claim it yesterday. I reckon it only took 1 month at least cause my workmate filed last January and her's is ready for claiming as well. Here in Cebu, the Department of Foreign Affairs is now located in Pacific Mall at the 4th Level, Pacific Mall-Metro Mandaue, United Nations Avenue, Mandaue City. I know the queue is the most stressful part of this process but with the right company, you will just be fine. We arrived about 6:30AM and the line was long. It is a bit intimidating but fret not, the line will subside in an hour or so. TIP: Bring snacks, extra pen, form of entertainment - book or music and tons of patience. Once you arrive, get yourself the Application Form from the guard at the entrance. Yes, a good writing pen is also helpful. Fill out the form and find the end of the queue. The mall staff provides plastic chairs for all applicants. Around 7:30AM the DFA staff started to give out the priority numbers. The staff will check all your documents as well as your form to see if you need to provide further documents. I like this part as they can assess what items you need to add to your application rather than find it out when you start the process already. You still have time to call someone for help or if you need to return home to get documents. TIP: Bring all pertinent documents. This includes valid photo IDs (Government issued IDs like SSS, TIN, Philhealth and even your old passport). IMPORTANT NOTICE: The general requirements vary from one person to another being that some of the documents you will provide may need supplemental items. This is why you need to bring everything that you have to ensure that your application goes smoothly. Case in point, my work mate's NSO Birth Certificate requires another document as the print out is too dark to be legible. Certainly, not her fault (and it was one of those isolated cases) but due to this, she was required to provide a Certificate of Live Birth which she did not have at that time. She had to return with the documents as well as get a new Transcript of Records from her school for good measure. We were instructed to return by 10AM and proceeded at the 4th level of the mall. What amazes me is that everything is well thought after, they have countless benches for all waiting applicants. The guard will call out the priority number range. Once your number is called, you will now proceed to the Step #2: Processing. This is where the DFA staff will individually check all your documents. This part of the application is the fastest and thorough. A staff can accommodate as much as 5-10 applicants in less than 30 minutes. They have a LED TV for your viewing pleasure minus the sound to ensure that you still pay attention to the numbers being called. We were done with this step in less than 15 minutes. NO KIDDING! Once you have successfully passed the processing area, you will now proceed with the Payment. At the time of application, we were told that there is no option for Rush Passport/Priority Passport which was at Php1200. The regular priority takes 30 business days at only Php950. 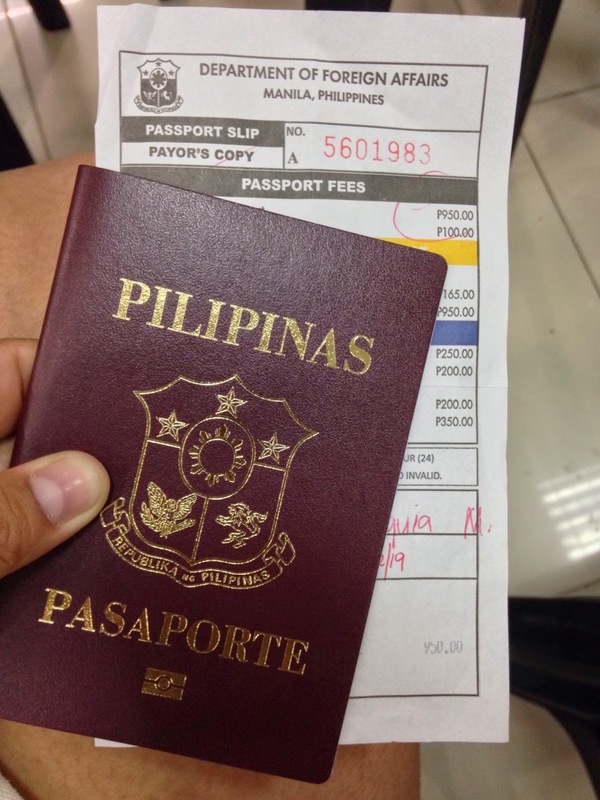 My cousin got her passport from a travel agency which costs Php2000, however she only had to visit DFA on a Saturday to have her photo taken. She got her passport after 30 business days. Either way, personal or via travel agency you will still get your passport after the 30 day period. After paying, you will then head out to the Encoding Section to have your data added to the database. You need to check the spelling of your name, correct birthday and other pertinent notes to ensure that this will not pose a problem once the passport has been printed. You are then required to remove all piece of jewelry to prepare yourself for the portrait capture. Wait until you are called for the final checking of the documents on a printed copy where you are required to sign. Then you are done! I have to wait for a month to get my passport. Everything has been completed before 12NN. It was easy and totally a good experience. Tip: Keep the receipt as this will serve as your claim slip. Tada! I got my passport yesterday and found out that this was ready last month. Too busy to follow up but happy that I have it already! Yaaay! Now the question remains, where to next? Very nice blog! Well done and many thanks! Congratulations! What will be your first entry stamp?